Irving Martin? Perhaps not a name to set most 60s music fans blood racing, but it should! He is responsible for some of the best UK pop productions in a variety of styles; Pop-beat, Harmony Vocal, R & B and dramatic Spectorian Productions, to name just a few. One reason for his name not being better known is....a lack of hits! 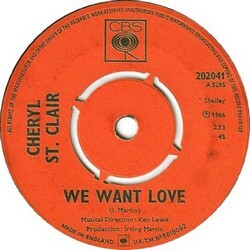 The one Top Twenty charter, (Number 12, August 1973, 13 weeks in the top Forty) Guy Darrell's, "I've Been Hurt" was a hit on Santa Ponsa (PNS 4) but it had originally been released in 1966. Who knows what might have hapened if this had hit the charts then? 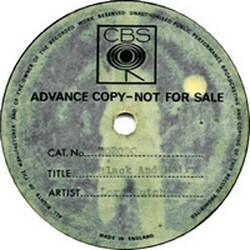 My first encounter with the credit "Production: Irving Martin", came on a CBS demo, white label with the big orange "A". (I was later to find most of my 'Irvings' looked like this!) 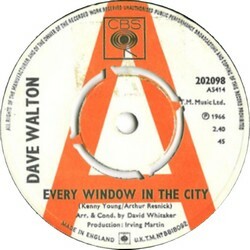 The record, still a firm favourite, was Dave Walton's "Every Window In The City". 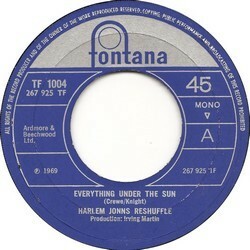 Irving Martin's name meant nothing to me, but the songwriter credits "Kenny Young & Arthur Resnick" did, as well as remembering that Jack Nitzsche had produced this title with Jerry Cole. It seemed worth paying the 50p at Notting Hill Gate's "Record & Tape Exchange". Few investments have paid, such a rich reward! The production is glorious, sounding as if it was recorded in an empty Royal Albert Hall. The music is HUGE, bass guitar, piano and tamborine accompany Dave's voice on the intro, then a short cavernous roll on the drums and the tempo increases, never losing control as the music continues to build. All the while, Dave's voice stays with the terrific lyrics, clearly heard. How the record manages to reach such a dramatic climax, I don't know, but it does! Surely one of the best and biggest Spector styled ballads this side of The Righteous brothers. How about Nitzsche's original? Great, but Irving gets the gold star! This was the start of actively looking for the Irving Martin production credit and, in most cases, I was not to be disappointed. 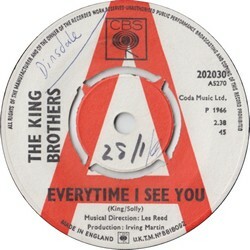 Thanks are due to Irving Martin for opening his archives, Jeff Glenn for his Reviews, Phil Chapman music restoration and Toshinari Mitsutomo, Al Williamson, John Kioussis, Ian Chapman, Geoff Ashford, Pontus von Tell and 45cat (a marvelous reference site for 45's) for additions to the discography, mp3s and label scans. Good song, (a relativly rare solo writing credit for Mort) but for me what makes it fab is Irving's production, only 19 years old, no arranger but creating magical sounds. Two more of my musical heroes were also involved in the recording; MORT SCHUMAN composer is one half of the late fifties - mid Sixties Doc Pomus / Mort Schuman hit writing machine, with big hits for big artists Elvis, Drifters, Dion et al. The partnership split and Mort moved to France and created more hits in the mid-sixties, co-writing The Small Faces "Sha-La-La-La-Lee" and Billy J. Kramer's "Little Children" among them; And Hawkwind co-founder MICK SLATTERY. Perhaps more of my love for Hawkwind later but of interest, in "The Saga of Hawkwind" by Carol Clerk (Omnibus Press) she notes that The Compromise were the first group signed to CBS in the UK, Bob Johnson supervised the session and they released two singles, second being "You Baby". Good song but for me what makes it fab is Irving's production, only 19 years old, no arranger but creating magical sounds. 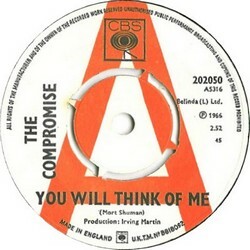 Two more of my musical heroes were also involved in the recording; MORT SCHUMAN composer, (a relativly rare solo writing credit) is one half of the late fifties - mid Sixties Doc Pomus / Mort Schuman hit writing machine, with big hits for big artists Elvis, Drifters, Dion et al. The partnership split and Mort moved to France and created more hits in the mid-sixties, co-writing The Small Faces "Sha-La-La-La-Lee" and Billy J. Kramer's "Little Children" among them; And Hawkwind co-founder MICK SLATTERY. Perhaps more of my love for Hawkwind later but of interest, in "The Saga of Hawkwind" by Carol Clerk (Omnibus Press) she notes that The Compromise were the first group signed to CBS in the UK, Bob Johnson supervised the session and they released two singles, second being "You Baby". The Albums below are all in Fontana's "Living Prescene" series. The albums below are all 'Library Music' releases and include tracks Irving Martin produced and co-wrote, usually with Brian Dee. Lord Sutch didn't only make great records with Joe Meek. 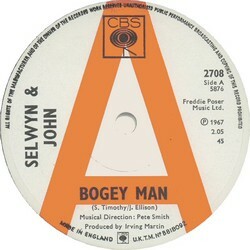 This Sutch written, Irving Martin produced B-side is one of his best. Play it with the lights out! Sweet Floral Albion said of this record "A super super Brit rarity! Amazing that a beauty of this quality remains almost totally unheard and unknown." A cover of the Ronettes, Phil Spector produced song recorded in 1966 but not released untill 1976. From 1969 an enjoyable brassy version by this fab beat group. 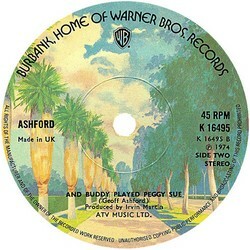 Geoff Ashford, the writer as well as performer on this goodie contacted me with the label scan and mp3. Thanks Geoff, checkout his MySpace web site. If I wondered if my admiration for Irving Martin's work was just a quirk in my make-up, I needn't have worried. I'm very pleased to be able to offer some first rate reviews written from the US side of the Atlantic by Jeffrey Glenn.